Thanks for the ffeature in the All types of Women group! thanks for the features in loving the color red, action photography,stop time with art, wild and crazy & minimal art groups! Love the red, very nice shot!! I love this shot :) the contrast is fantastic! Wow! 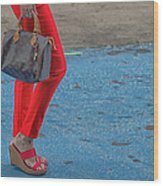 Those pants and shoes are really, really, really red, Karol! Ooooohhh! Fashion, style and smashing color. Love it! You will always find fashion and style in NYC.